That Dutch people love Michael Buble? That there are in fact three red light districts? There's the main one which everyone knows about, and two others in predominantly residential areas. You're walking along a quiet canal-side street, looking casually at the classic walk-up apartments lit up warmly with candles in the window and maybe a cat sleeping on the windowsill...then BAM! Almost-naked woman in a window, framed by neon red lights. Oddly, a nice mix... To my urban planning geeks back in Calgary - take note. That the majority of taxis in Amsterdam are late-model Mercedes? Given the rates they charge, the only surprise here is that they're not Ferraris. That if you were offering the clerk a million dollars in cash, Michael Buble tickets, and a puppy, you still couldn't get an iPhone through T-Mobile here? It's insane what non-residents need to go through to get one. That riding a Dutch bike is highly addictive, and helps clear your head no matter what kind of day or night you've just had? My ride. 75 Euros - money well spent. That those douchey, pouting teens from Twilight are just as ubiquitous here as in North America? That "gevulde speculaas" is not an uncomfortable gynecological instrument, but rather an amazing Dutch cookie-like treat with almond filling? That clicking on the ads on this page really does work? I made $12.31 (U.S.) in October thanks to you people - that's enough for several pounds of gevulde speculaas. Thank you, and keep clicking every day! Sinterklaas. Saint Nicholas. Or Sint, for short. 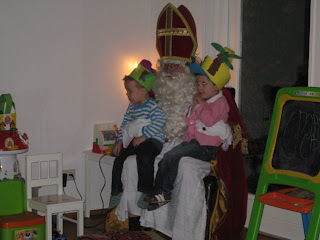 December 5th sees Sint all over the Netherlands, aided often by his helper Zwarte Piet (Black Pete). The Feast of Sinterklaas resembles the North American Christmas - although it is celebrated 20 days earlier, and with a few subtle differences. First, and most commonly expressed by the naive expat from Canada or the U.S., is "Holy crap is that ever racist", upon seeing Zwarte Piet. Dressed in blackface, with afros, and acting mildly slavish (think Santa's elves, maybe in Mississippi circa 1950), these little imps are explained in various ways, as the Devil (who is enslaved by St. Nicholas), to just straight-up slaves, to the totally benign kid-who-climbed-down-a-chimney-and-is-now-covered-in-soot. 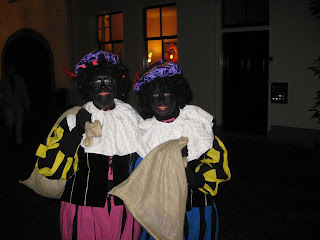 Piet throws candies to the kids in parades, hands out gifts, and causes some mild mischief throughout the month. So we'll adopt the latter definition above, as most Nederlanders prefer to do anyhow. And there doesn't seem to be any malice nor any sinister undertones to people of all ages dressing up as Piet, so we'll move on. But the lingering impression is an uneasy one, and you won't see me or any of the expats I've spoken to about it smearing on the blackface anytime soon. 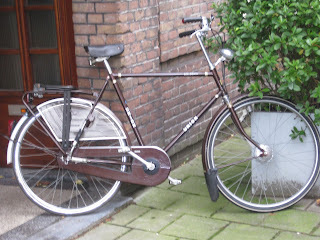 Anyhow... back to Sint. 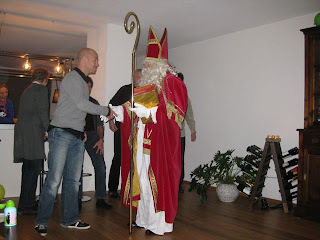 I had the good fortune of spending a pretty authentic Sinterklaas feast with family, and the uncle provided the full entertainment as a very impressive version of the old gift-giver. Sint comes over from Spain (know why? I don't. Fill us in on the comments below - first correct answer wins a pepernote). I'm thinking it's because he prefers to spend as little time getting rained on in Holland during November and December, and it's a heck of a lot warmer than the North Pole. The tradition is to give gifts to the kids of course, and many adults do a Secret Santa gift exchange with a set monetary limit, just like back home. Often these gifts can be homemade, including elaborate wrapping for the recipient to wade through, like jello pudding made to simluate sheep guts (really, this is tough to explain - just trust me on this). A marked difference is the more celebratory feel than back home - all the adults join the kids in singing a bunch of songs to usher Sinterklaas into the house, and poems accompany each gift - the giver needs to write a few lines to the getter, usually including some mild ribbing. On the downside, there is less of a turkey-gorging feast. To celebrate the actual Christmas day on December 25th, there's still no turkey - European gobblers can breathe a sigh of relief while their cousins across the ocean get carved up - just nice dinner, this time sans Piet.